The Ellen Whitcher Service Award will be presented and branch members who have been recognized by making the branch contribution to the national AAUW in their names will be acknowledged. DUES: Our Finance Officer, Gael Murakami, will be on hand to collect annual dues from those who wish to pay at the meeting. We are able to accept either checks or credit card payments from those who wish to pay that way. Dues for 2019-2020 are $75 (national $59 + $16 branch) for regular branch members, $16 for Paid Life Members and student members, $0 for Honorary 50 Year Members. Student member dues vary depending on your status, National AAUW has changed its policy and if you are currently a graduate student working toward a degree, you may pay the student rate (contact Gael Murakami so she can change your status on the national roster (gaelmurakami@gmail.com). Undergraduates at UAF who are e-members, only pay the branch dues of $16. An emailed invoice will be sent to members a week before the meeting and if you wish you may pay on-line by clicking on the link in the email. This entry was posted in Uncategorized on April 14, 2019 by gbmurakami. Our 82nd annual meeting will include election of branch officers for 2019-20, update on Equal Pay Day and Scholarships, and Financial Report. Need suggestions for potluck dish? Call Rita or Brenda. Please also bring serving utensils. Please RSVP to Rita (ritaosborne@gmail.com or 479-4535) or Brenda (bfayebird@gmail.com or 388-0557) for planning purposes. This entry was posted in Uncategorized on March 8, 2019 by gbmurakami. (When the Feb newsletter was sent out, we had not yet confirmed the meeting location. It will be held in the Conference Room at Noel Wien Library. It is at end of hallway to the right of the Auditorium. Please join us on Saturday, February 23, 11am-noon, Location: Conference Room at Noel Wien Library. Topic: Economic Security and the Work Smart program. This is a national effort of AAUW for women to negotiate their financial futures and to eliminate the gender pay gap–for good. In addition to viewing a 6 minute video we’ll have the opportunity to sign up for the online 1 hour 10 minute Work Smart program which can be stopped and started at any time. We’ll also be setting some goals for our branch. Invite young friends to join in this program. Open to all women and they do not need to be AAUW members. This entry was posted in Uncategorized on February 20, 2019 by gbmurakami. AAUW luncheon on Saturday, January 12, 11:30 am at Gallo’s Mexican Restaurant, 60 College Road. This is an informal luncheon with no planned program so it’s a chance to get to know your fellow AAUW members. Please RSVP by noon on Friday 1/11 to Rita at ritaosborne@gmail.com or 479-4535. This entry was posted in Uncategorized on January 7, 2019 by gbmurakami. Spouses, partners and guests are welcomed. Directions: Take the Parks Hwy south to Milepost 349 and turn left onto Cripple Creek Road. At the fourth street turn right onto Aspenwood Drive (Aspenwood is about 1.2 miles down Cripple Creek Rd and all previous streets only go to the right). The first house on the left is a log home, with “Musick Way” on the driveway. Carpooling is encouraged so if you would like a ride, please contact Rita at ritaosborne@gmail.com or 479-4535. This is a potluck and the hosts will provide a main dish. Please bring a side dish, bread or dessert. Additional beverages are appreciated. Contact Rita if you have questions. ritaosborne@gmail.com or 479-4535. There will be a gift exchange which is usually a mix of interesting and very interesting gifts and white elephants. We also use this as an opportunity to contribute to the Interior Alaska Center for Non-Violent Living. There will be a collection of gift type items so the residents can provide gifts to others (please don’t wrap these). Wrapping paper and ribbon/bows are also appreciated. For gift suggestions, please go to this web page: http://www.iacnvl.org/holiday The Interior Alaska Center for Non-Violent Living’s vision is a community free of violence. IAC provides programs to address domestic violence, sexual assault, child sexual abuse, suicide intervention, and crisis services for victims of other violent crimes. This entry was posted in Uncategorized on December 10, 2018 by gbmurakami. AAUW’s mission is advancing equity for women and girls through advocacy, education, philanthropy, and research. 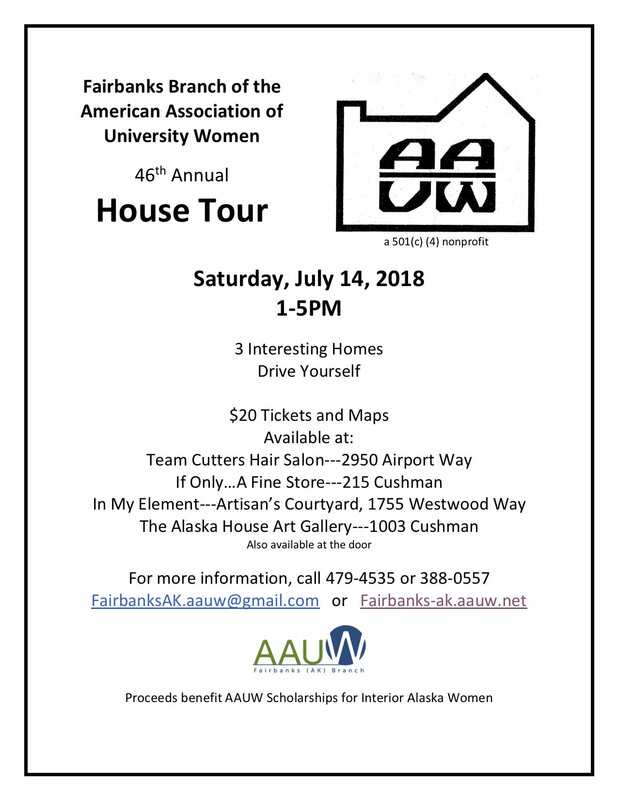 The Fairbanks branch was established in 1936 and area women and men are involved in activities that support national AAUW programs, promote awareness of public policy issues, and support both local and national women scholarships/fellowships through our fundraising efforts. This entry was posted in Uncategorized on November 12, 2018 by gbmurakami. Bring a Friend to Brunch! Join us for a casual brunch potluck where members reconnect and our guests hear about AAUW. 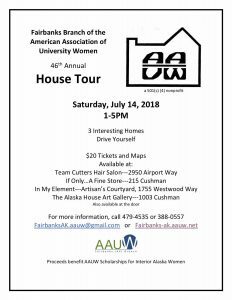 Membership Chair, Carla Willetto, will share AAUW programs and policy after we enjoy good food and good company at the Fairbanks Resource Agency. Also, half price memberships for new members will be available since the meeting is open to the public. Please RSVP by October 24 to Brenda bfayebird@gmail.com 388-0557. Directions to FRA is to go south on Gillam Street from Airport, turn right at the first intersection which is 14th Ave, and turn into the second driveway. The address is on Airport but access is from 14th St across from Mary Siah. This entry was posted in Uncategorized on October 9, 2018 by gbmurakami. This entry was posted in Uncategorized on September 16, 2018 by gbmurakami. This entry was posted in Uncategorized on June 30, 2018 by gbmurakami. This entry was posted in Uncategorized on May 6, 2018 by gbmurakami.